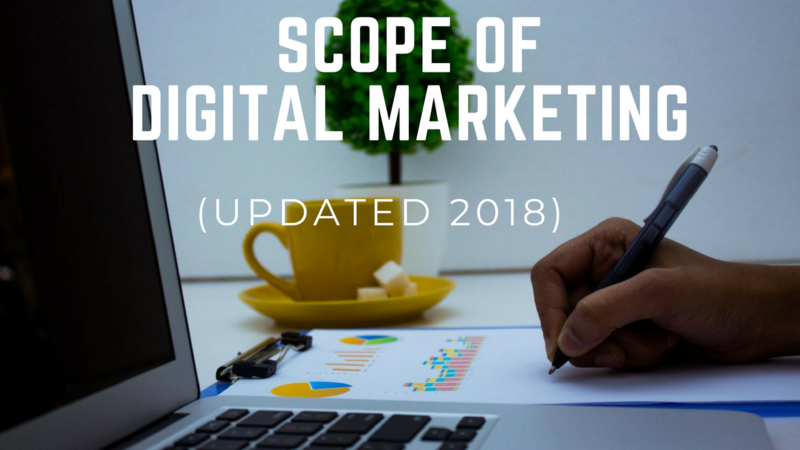 Scope of Digital Marketing in India & How to get started? 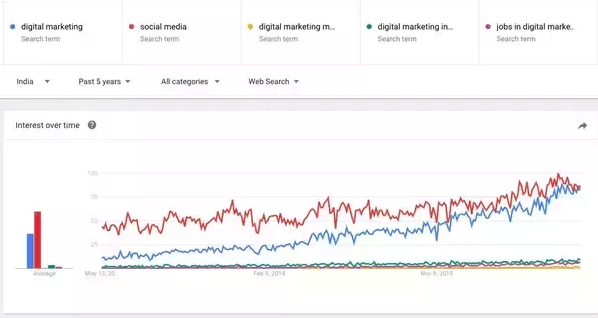 A Google trend shows the growth of key term: Digital marketing. In the last 2 years, it has skyrocketed similarly the term social media has equally hiked. Today Digital marketing requires a lot of skills than how it was a few years back. When I started my career in 2002, it was completely different. Scroll down to see the list of skills required with accompanying free resources & tools. The competition is high. Everyone wants to get into Digital marketing. From our internal data (students at web marketing academy) HR professional, sales & marketing, customer support, IT professionals, developers, web designers, entrepreneurs, bloggers, content writers, stay at home parents, fresh graduates. Today’s Modern Digital Marketers should constantly sharpen their skill sets. In the early days, it was the world wide web, then social media, then mobile and now Artificial Intelligence AI and machine learning. What does this mean for a Digital Marketer? A few months back, yes few months not years back, Digital Marketing was about learning skills like Content, Social Media, SEO, Google ads, Facebook ads, but now it’s all about Machine learning, AI, Voice Assistance and more. Now a digital marketer should be updated every minute, AI is smarter than human, here is how Google Duplex works. A digital marketer’s job is to make things easy for robots. How can you make it simpler for AI to find your information? You have to learn technical skills like AMP, Structured Data, Voice SEO, Customized ads for Individuals. For example, people are searching for search terms like Is Digital Marketing Course Right for me? Should I take up an AI course? Is it worth taking up online digital marketing certification courses? I wish I could have learned about digital marketing, the career opportunities it has to offer and everything else related to the field, in college. But, unfortunately, most colleges do not have anything to do with digital marketing in their curriculum. At best, we can find a couple of courses in E-Commerce basics. Digital Marketing is so much more than E-Commerce and the only way for someone who is interested to learn about it is through self-effort and a handful of institutes like Web Marketing Academy (WMA). At WMA, we are looking to make some progress on this front, and after evangelizing for a few years, we are proud to have helped introduce Digital Marketing in the curriculum of Christ, Vanguard, and WLCI. To cite an example, one of our own students, who had an experience of 8 years in a traditional Marketing role, quit the job to take our Digital Marketing course. Two months after the course, he had an offer from a Fortune 500 company of 17 lakhs per annum. There are much more examples like this. If you look at the job listings on LinkedIn, about 20-25% of the jobs listed are in the Digital Marketing realm. This is no surprise as the Digital Marketing industry is growing at a fast pace and is need of skilled professionals. Unlike a few years ago, it is a bit of a challenge to stay up to date in the Digital Marketing industry today. It is no longer enough to read a few blogs and the occasional book. This is probably enough to have a superficial knowledge of the industry and is certainly a good starting point. But it is nowhere near enough if you want to become a skilled professional. The industry is so dynamic that by the time a book is published, what is written in it will be outdated. The Question is How do I start a career in Digital Marketing? Mobile Apps & Plugins have simplified Marketing. It’s just identifying the right apps to create amazing content. Creating relevant and timely Content is one of the most important skill. Learn some basic Photo & Video editing skills. I had a few participants with more than 5-6 years of experience in traditional marketing. They quit their current job to pursue a career in digital and had to wait a couple of months after taking up the digital marketing management course to get an offer. But they ended up with an offer to double their previous pay. Finding a job that fits you might be challenging, so unless you have to quit to get started don’t quit your current job. Get started while you are still at your job, and spend a few hours a day on digital. We will get into blogs, websites to follow in a bit. While learning from written content is one way, another highly effective way is by participation. I used to be a shy guy until I got exposed to events in 2003 when my ex-boss John used to take me to a lot of networking events. This was when I got rid of my shyness and gained confidence. And when I moved to India, realized that there are many of us, who have great talent but don’t have the opportunities to meet like-minded people and a platform to network. That is the reason for starting the OME Community https://www.facebook.com/groups/omecommunity/. There are several meet-ups and hangouts happening in your city similar to this. Attend a few and stick to the ones that you will benefit from the most. If you attend events, webinars, and conferences, you will not just learn from the speakers, but also from your fellow attendees who will be more than willing to exchange experiences. It can be a good place to see how your peers are doing things and how you match up to them and what you can learn from them. Andy, with whom I was working with, is a speaker, who helps CEO’s in their leadership and business. In one of his sessions, in front of all the attendees, he announced that “Today, Suresh will speak to you about how to create a blog.” I was scared to death, and I told him, “Andy, it is hard for me to even speak with our colleagues and you’re asking me to talk to these CEO’s! He replied, “Don’t worry, just share what you do for Fox advertising.” So I shared how to create a blog. The interesting thing was the CEO’s didn’t care about how I spoke, but they cared about what they got out of it. Each and every one of them came to me after the event and thanked me for sharing. It was one of those wonderful moments. Since then I have learned to speak in public. Yes, it wasn’t easy for a shy guy to speak in front of people. It took a lot of time and practice, and I’m still working on it. During those days, I loved attending conferences. In 2005 & 2006, I attended Podcamp, Pub Con, and several such events. I learned most of the digital by attending conferences. It is about the energy and people that come to the events. Learning from others is one of the best ways to learn. When they share their passion, it makes it easier for us to make things happen. Attend Conferences like the ones we did in 2011: Search marketing summit Bangalore: http://www.youtube.com/watch?v=08ienQhNMrA Adtech, TFMA, Click Asia Summit, Search engine strategies Expo to name a few. It takes less than five minutes to start a blog on WordPress or blogger. Here is a blog post written by Amada titled, “What I Wish I Learned in Business School” where she talks about blogging. And update it frequently. Do not worry about who reads it or what impact it makes to someone else. The first person a blog will impact is the author herself. Like Seth Godin famously says ‘If you do not ship, it is not art”. You should put your thoughts out there in the public domain. Putting down your thoughts will ensure that you do research, which will help you learn better. When you put things down trying to ensure that another person reading it will be able to completely understand what you say, you will reassess your assumptions and indulge in a logical thought process. Hubspot offers them for free and these certifications are widely recognized in the industry. Before you take the exam, read this blog post on how to pass the Inbound marketing certification: https://www.webmarketingacademy.in/inbound-marketing-certification-2013/. I have to say it is not easy to pass, but going through the videos will be extremely useful. 7. Is it worth taking up online digital marketing certification courses? 9. What about taking a digital marketing course from web marketing academy? Well, you can, but before that, see how it has changed the lives of these people: http://goo.gl/W0YZO. Still, have questions about digital marketing for your career ? Give us a call and talk to us, we would love to guide you in the right direction. My number is 9731388721. Are you interested to take up the Digital Marketing Course? 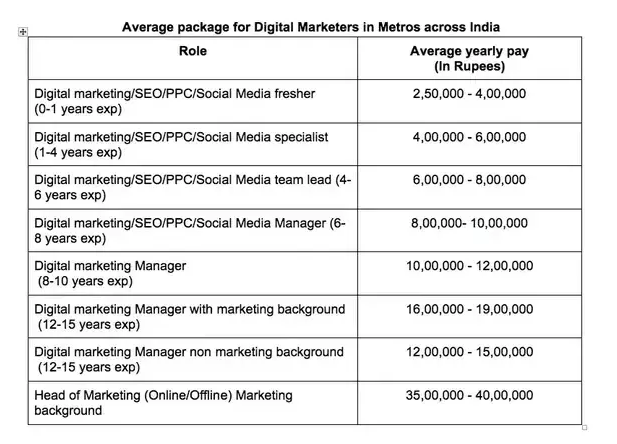 The scope of Digital Marketing in India. How to get started in Digital with detailed beginners guide to Digital Marketing. What are the skills to become a digital marketer in 2019? Resources to upgrade your skills with these latest trends.